A nursery killer who carried out murders disguised as Batman villain 'The Joker' told a court on Monday he was left "no choice" but to stab to death two toddlers and their minder at a Belgian creche -- despite saying he knew murder was wrong. 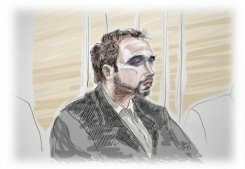 "I was aware that you should not (kill) but I did not see any other choice," Kim De Gelder told the court in Ghent, which is considering whether the 24-year-old can be held responsible for his knife rampage. AFP - A nursery killer who carried out murders disguised as Batman villain 'The Joker' told a court on Monday he was left "no choice" but to stab to death two toddlers and their minder at a Belgian creche -- despite saying he knew murder was wrong. An artist's impression of Kim De Gelder on the first day of his trial at Gent's courthouse on February 22, 2013. 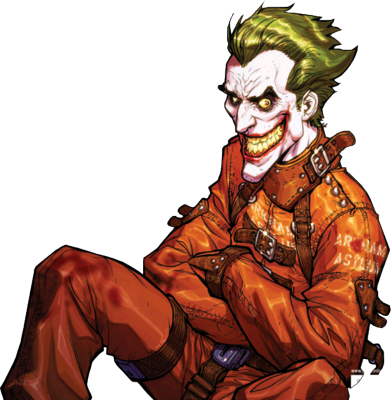 A nursery killer disguised as Batman villain 'The Joker' told a court on Monday he was left "no choice" but to stab to death two toddlers and their minder at a Belgian creche -- despite saying he knew murder was wrong. "I was aware that you should not (kill) but I did not see any other choice," Kim De Gelder told the court in Ghent, which is considering whether the 24-year-old can be held responsible for his knife rampage. "I was pushed towards this choice, perhaps from outside. It came directly," De Gelder said in reply to lengthy questioning by the presiding judge. De Gelder is charged with killing the two infants and their 54-year-old carer in an attack on the Fable Land nursery in the town of Dendermonde in January 2009, as well as the attempted murder of 22 others at the creche -- including 16 babies and toddlers. De Gelder is further charged with murdering an elderly woman in a separate attack a week earlier. The court must determine whether De Gelder can be considered sane or not. On Friday, his lawyer told the 12 jurors his client was a paranoid schizophrenic who "is irresponsible and cannot be punished." Just after the release of cult 2008 Batman movie "The Dark Knight," De Gelder entered the nursery with his hair dyed red and his face painted white with black around his eyes -- like the film's villain 'The Joker,' as played by the late Australian actor Heath Ledger. Last year, US youth James Holmes was accused of killing 12 people and wounding 58 in a cinema screening the sequel of the film. De Gelder, speaking in Flemish, told the court on Monday he would "keep the explanation of his motives for the end of the trial, or for another trial." He said he had had a happy childhood but relations with his parents became difficult when he was around 15 as they opposed his plans to study psychology or law. At age 18, De Gelder said he thought of committing suicide by lying under a train but then changed his plans to "taking the lives of other people." Saying he was in despair, he said he had lied to psychiatrists, telling them during the investigation that he had heard "voices" pushing him to act. "You had other choices, you could have looked for a job," the presiding judge interjected. "I already told you it was the crisis," De Gelder replied. Why did you search out people unknown to you? he was asked. "The people you know, the people you like -- you do not kill them," De Gelder replied. At other times the accused appeared irritated -- as when he took the judge and prosecutor to task, the latter for supposedly "smiling" during his questioning. Police said De Gelder planned to attack two more nurseries, a police academy and also Belgium's king -- but he was picked up by officers within an hour of the nursery rampage.